On Sunday, June 19th, Líithi Lushede Coven held their public Midsummer ritual at Waterfall Park in Independence, MO. Despite being spectacularly hot leading up to this day, the weather gave way just a bit for a relatively comfortable outdoor ritual! As usual, Líithi Lushede public rituals bring out many Kansas City pagans. These rituals not only draw the community together but are elegantly written and performed. They're always such a treat! While High Priestess Gwenhwyfar Wyrd typically leads rituals, Líithi Lushede has been alternating ritual leaders. For Midsummer, Willow Wyrd led. She was joined by Jason as acting High Priest. Ritual began by the casting of the circle and the blessing of the space using purified water and incense. Once cleansed and blessed, the elemental quarters were called starting with south, fire, as appropriate for a holiday that celebrates the sun, and ending with east, air. 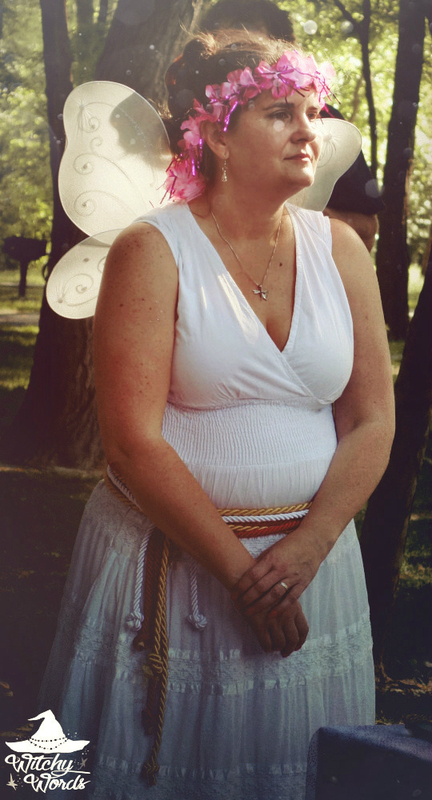 In addition to the elements, Willow called upon Titania, the Queen of the Fairies. And Jason of course called upon Oberon, King of the Fairies. We were then given a quick synopsis of the story A Midsummer Night's Dream by Shakespeare. For those who haven't seen or read the play at some point, A Midsummer Night's Dream is a comedic telling of marriage between the Duke of Athens to the Amazonian queen and the mischief the fairies who inhabit the forest create. The specific part of the story Willow focused on was the trick the fairies play on two different couples: Hermia and Lysander, and Helena and Demetrius. You can read the summary of a Midsummer Night's Dream here. Jason, however, had another story to tell from the Philippines. Legend has it that, a long time ago, a handsome man dreamed of marrying the most beautiful woman in all the land. However, he was so arrogant and boastful that he made ladies feel sorry for themselves. One day, he came across a maiden in the whitest dress and thought that she was so beautiful. Suddenly, she vanished. He spent a very long time looking for her. So long, in fact, that he became enraged and yelled out that she was not truly beautiful, that she was absolutely hideous with a flat nose and big ears. He then fell asleep under a tree and, upon waking, the beautiful maiden stoof in front of him. This maiden was in fact a fairy and, for his harsh criticism of her, she cursed the man to live as a bug until he could find a woman whose beauty surpassed her own. His only source of light was his own flickering tail. You can read the full legend here. Following this, cakes and ale were served in the form of sweet cake and almond milk. Adding to the ritual was the bard John and his guitar. ... And the circle was closed. Afterward, we stayed for a community building exercise that involved sending heartfelt energy out to those who needed it. And of course, the festivities didn't end there with a full potluck and raffle as well! 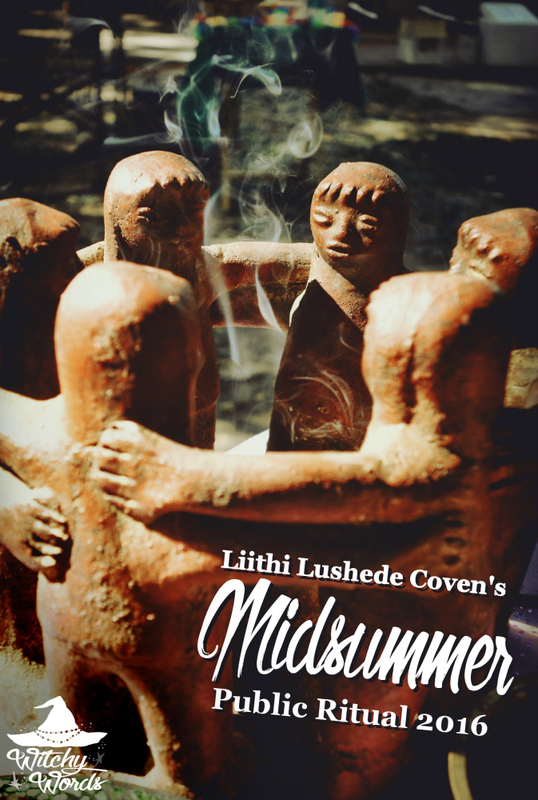 Líithi Lushede Coven works incredibly hard each and every sabbat to bring the community together for a fantastic celebration. 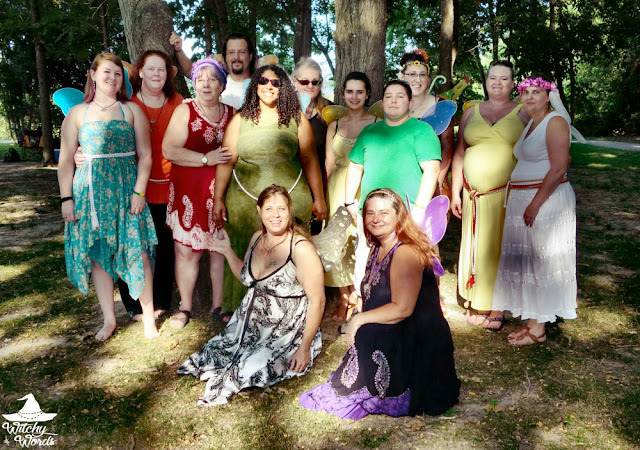 The KC pagan community just wouldn't be the same without them. A huge thank you to Willow and Jason for leading a gorgeous Midsummer ritual, and a special thank you to Heidi for helping me juggle my camera and phone with the firefly, cakes and ale! I hope you had a blessed Midsummer, everyone! Stay tuned: Circle of Fountains Midsummer ritual is coming up next! If I'm ever in that area, I'd love to attend one of these rituals!